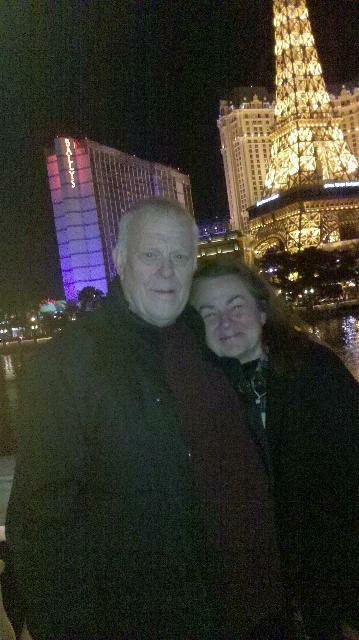 Kate and I flew to Las Vegas for one day and two nights — my only gal cousin, Pris, is living there with her husband. It was her birthday. We saw the water show for free at the Bellagio. Best thing to watch in Vegas. We spent no money gambling. The Eiffel Tower is newer than the one they have in Paris. A security guard told me that the Eiffel Tower had been designed by a local architect: Bergman. I explained that the designer was actually a guy named Eiffel. The guard thought I was nuts. By the way it costs $22 to visit it. It’s half the height of the one in Paris — the charge there is $18. The town is in serious financial difficulties. Maybe things will pick up on the weekend. Dunno. And, really don’t care. The one word that comes to mind to describe Vegas is Sinister. They have penny slots. This means they can get your last four cents. How bad is it? Well, they have a law — it is illegal to pawn your dentures. So they’ll take you for your last penny and leave you with just enough to put the bite on someone for bus fare. That explains the entire concept of that giant but glitzy rat hole. I do not believe much in God or the Devil. But if I did — I would think Lucifer had hired a bunch of ex Enron MBAs to set up that huge psychic slot machine on the desert sands. And I would think that God had abandoned the place for a happier vacation spot: perhaps Sodom and Gomorrah in an earthquake. Homes that cost $700,00 at the height of the boom — can be had now for $150,000. And yet the rebuilding continues. Cost billions and can’t sustain itself. Or so the rumors go. It reminds me of Superman’s home town on Krypton — seconds before it imploded to the utter dismay and astonishment of the residents. 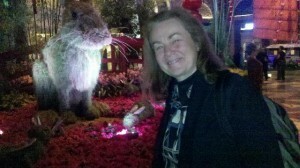 Here is my lovely wife in the lobby of the Bellagio where they celebrate the Chinese Year of the Rabbit with — guess what? By the way, the coat on that giant 12-foot rabbit is made from skinned panda bears. Apparently a pack of them lost their hides at the 21 table. That’ll teach them to hit a hard 17.